Click on the event heading to reveal the flyer or more information. Click Here for the MABA Team App. 9.30am 16 X 2,4,2. 18 X 3b. MABA meeting 3.30pm. Sun., 29 Apr. 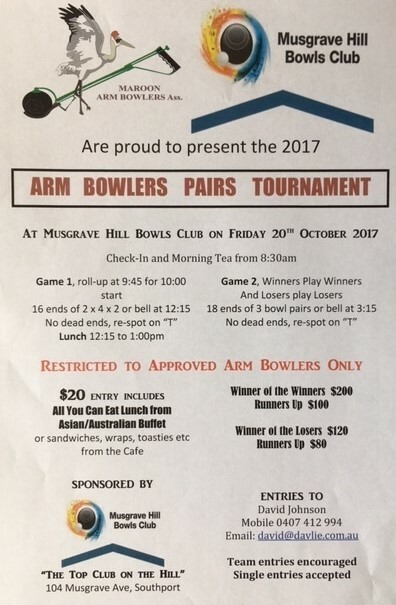 ‘18 – Wed., 2 May ’18 at the Musgrave Hill Bowls Club. This event is already full, which shows how much interest there is from the Arm Bowlers in South-East Q’ld. There maybe some drop outs between now and the event so they are still taking names and contacts for spare teams and individuals. This will be the last chance for some players to get into the extended squad to train for the national titles. 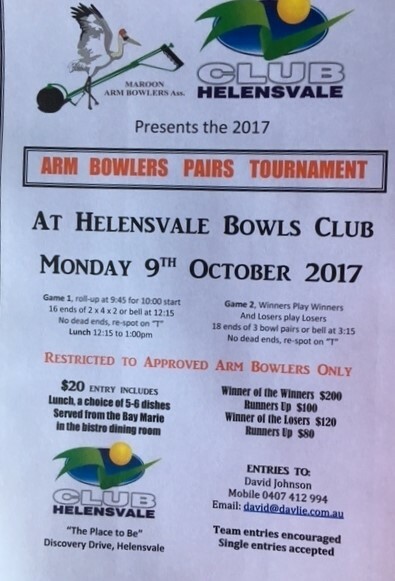 Up to six new bowlers will be selected to join the current squad of 16 members to train between March and June, after which a state team will be selected to represent Q’LD at the Arm Bowler Nationals in September 2017 at Moama. 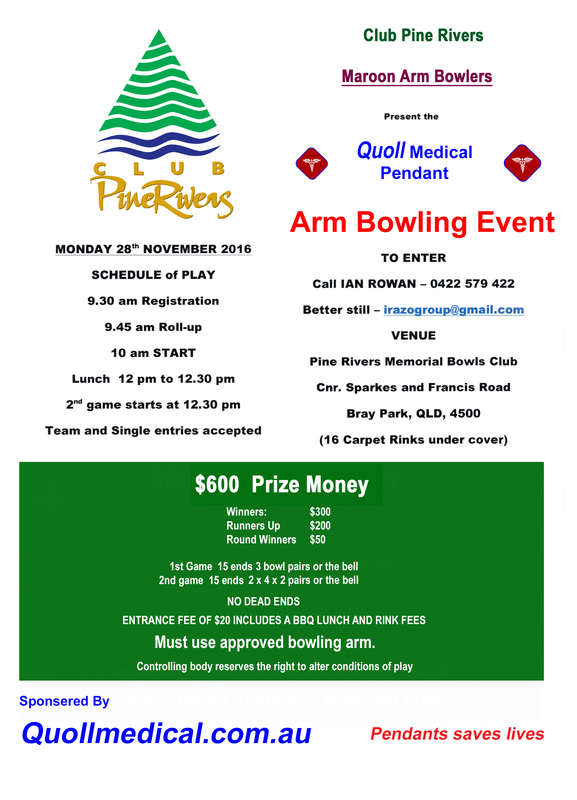 Check out the Latest News on Armed Bowling from Bowls Queensland or ABA’s Facebook page. 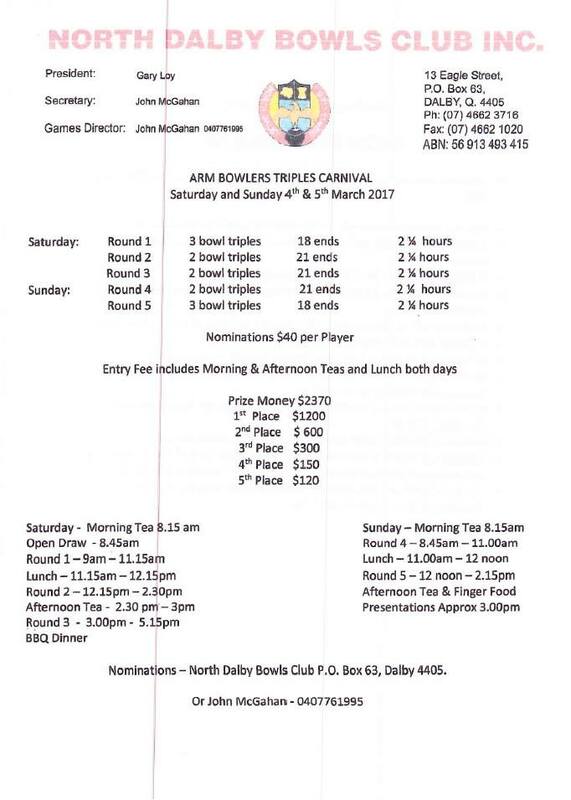 North Dalby Bowls Club. Contact details are on the attached flyer. Email geoff.geary@gmail.com or Mobile 0438660479. 4th Sep. – 8th Sep. 2016 National Championship at Broadbeach BC, Queensland. 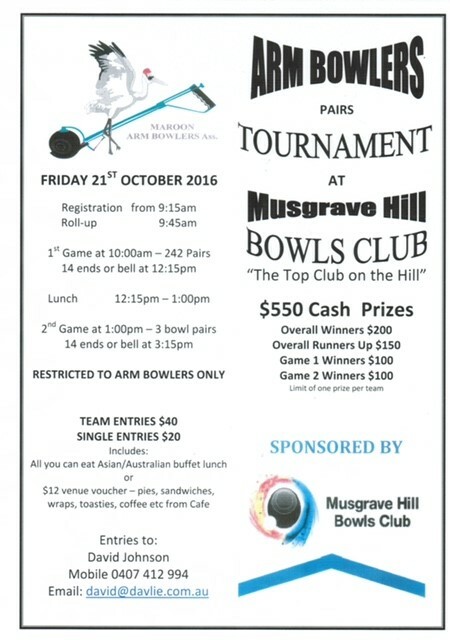 15 Aug ’16 – Urangan Bowls Club host Maroon Armed Bowlers Day. 6 Jul ’16 – Broadbeach Armed Pairs, won by Phil Gude and Barry Ansett. 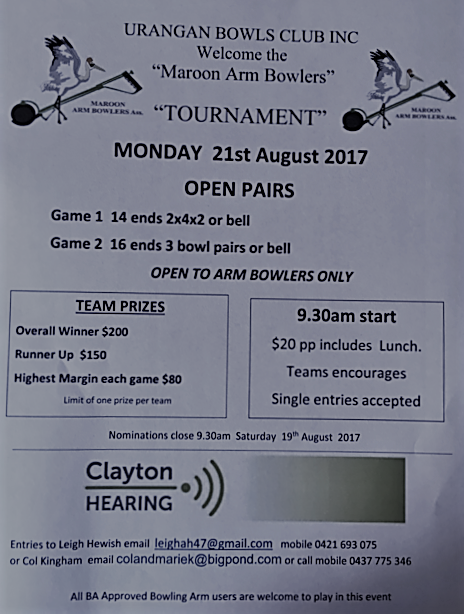 2016 will be the first time that the Australian Open will see teams of Armed Bowlers whom represent the Maroon Arm Bowlers Association. 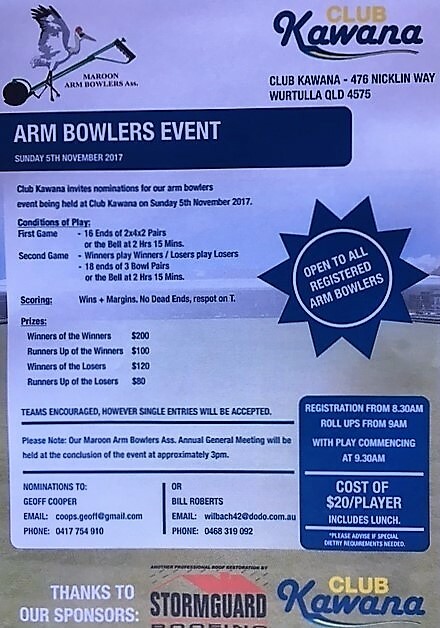 This year the Maroon Armed Bowlers Association has entered three sides into the $250,000 Australian Open consisting of a ladies team and two men’s teams to compete in the open pairs and fours. 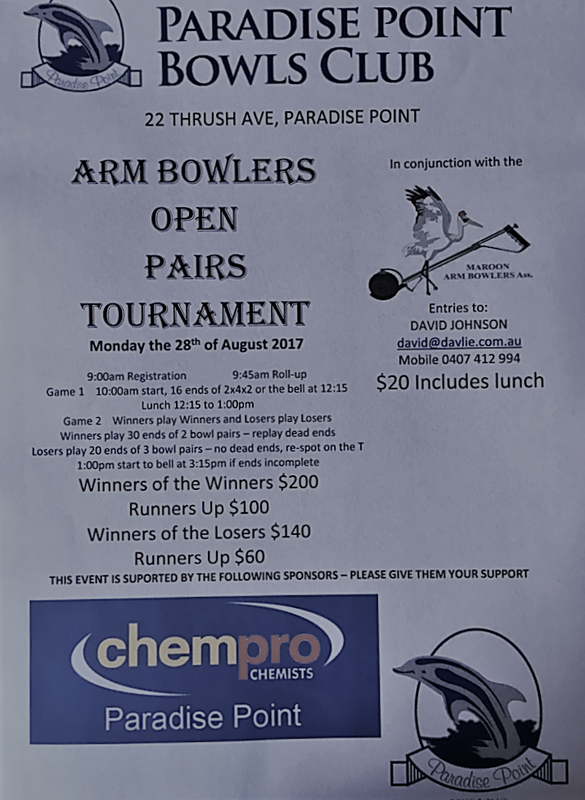 Members of the Maroon Armed Bowlers Association come from all parts of Queensland and later in the year will host the National Arm Bowlers Tournament played in September 2016, proudly supported by Broadbeach Bowls Club on the Gold Coast. Threatened heavy rain has put the above event in doubt……stay tuned. VIC – Barry Anset, Ray Arnold, Doug Corrigan, Harry Dahllof, Phil Gude, Tony Long, Ann Power, Adele Ryan, Lee Wesley. NSW – Mick Cleary, Jeff King, John Passfield, Allan Starrett, Roger Sydenham, Stan Wrzeczycki. SA – Arch Baxter, Rodney Egge, Stuart Reither, Don Sheldon. Q’LD – David Johnson. Over the next six (6) months the performance of individual Arm Bowlers in Arm Bowlers events will be tracked and recorded. It is envisioned that a squad of 30-40 Arm Bowlers will be announced in March-April 2016. 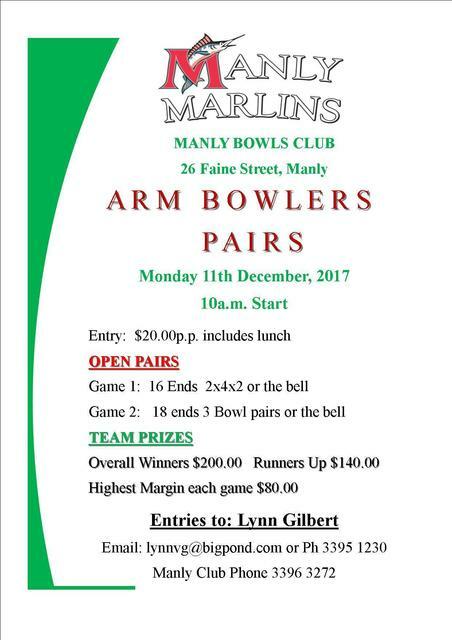 Practice sessions will then allow Selectors to trim the squad to the final 18 to represent Queensland in September 2016.” (Courtesy of the MABA)….Get out there and practice!